Definition at line 296 of file flow.h. Definition at line 295 of file flow.h. Definition at line 297 of file flow.h. Definition at line 63 of file flow.h. Definition at line 101 of file flow.h. Referenced by FlowChangeProto(), FlowSetChangeProtoFlag(), and FlowUnsetChangeProtoFlag(). Definition at line 176 of file flow.h. Definition at line 143 of file flow.h. Referenced by AppLayerExpectationSetup(), and StreamTcpPseudoPacketCreateStreamEndPacket(). Definition at line 148 of file flow.h. Definition at line 105 of file flow.h. Definition at line 211 of file flow.h. Definition at line 213 of file flow.h. Definition at line 214 of file flow.h. Definition at line 215 of file flow.h. Definition at line 210 of file flow.h. Definition at line 209 of file flow.h. Definition at line 208 of file flow.h. Definition at line 212 of file flow.h. Definition at line 140 of file flow.h. Definition at line 138 of file flow.h. Definition at line 76 of file flow.h. Referenced by FlowHasAlerts(), and FlowSetHasAlertsFlag(). Definition at line 93 of file flow.h. Referenced by AppLayerParserStreamTruncated(), DetectBypassRegister(), DetectDNP3Register(), DetectDnsQueryRegister(), DetectEngineInspectENIP(), DetectEngineInspectModbus(), DetectEngineStateResetTxs(), DetectHttpRequestLineRegister(), DetectHttpResponseLineRegister(), DetectLuaRegister(), DetectPcrePayloadMatch(), DetectTemplateRustBufferRegister(), DetectTlsFingerprintRegister(), DetectTlsIssuerRegister(), DetectTlsJa3HashRegister(), DetectTlsJa3StringRegister(), DetectTlsSerialRegister(), DetectTlsSniRegister(), DetectTlsSubjectRegister(), DetectTlsValidityRegister(), DetectUricontentRegister(), DetectUrilenValidateContent(), FlowInit(), OutputJsonRegister(), RegisterModbusParsers(), SCSigSignatureOrderingModuleCleanup(), TagTimeoutCheck(), and UTHBuildFlow(). Definition at line 95 of file flow.h. Referenced by FlowInit(), OutputJsonRegister(), and UTHBuildFlow(). Definition at line 133 of file flow.h. Definition at line 135 of file flow.h. Definition at line 249 of file flow.h. Definition at line 247 of file flow.h. Referenced by AppLayerIncTxCounter(), and AppLayerProtoDetectGetProto(). Definition at line 248 of file flow.h. Definition at line 58 of file flow.h. Referenced by DetectSignatureApplyActions(), FlowHandlePacketUpdate(), and StreamTcpPseudoPacketCreateStreamEndPacket(). Definition at line 60 of file flow.h. Referenced by AppLayerParserParse(), FlowHandlePacketUpdate(), RegisterSSLParsers(), SMTPParserCleanup(), and StreamTcpPseudoPacketCreateStreamEndPacket(). Definition at line 202 of file flow.h. Referenced by DetectBypassRegister(), DetectDceIfaceRegister(), DetectDceOpnumRegister(), DetectDceStubDataRegister(), DetectDistanceRegister(), DetectDNP3Register(), DetectDnsQueryRegister(), DetectEngineInspectENIP(), DetectEngineInspectModbus(), DetectEngineStateResetTxs(), DetectFlowMatch(), DetectFlowRegister(), DetectFtpbounceRegister(), DetectHttpRequestLineRegister(), DetectHttpResponseLineRegister(), DetectLuaRegister(), DetectPcrePayloadMatch(), DetectSshSoftwareVersionRegister(), DetectSshVersionRegister(), DetectSslStateRegister(), DetectSslVersionRegister(), DetectTemplateRustBufferRegister(), DetectTlsFingerprintRegister(), DetectTlsIssuerRegister(), DetectTlsJa3HashRegister(), DetectTlsJa3StringRegister(), DetectTlsSerialRegister(), DetectTlsSniRegister(), DetectTlsSubjectRegister(), DetectTlsValidityRegister(), DetectTlsVersionRegister(), DetectUricontentRegister(), DetectUrilenValidateContent(), FlowHandlePacketUpdate(), RegisterModbusParsers(), SCSigSignatureOrderingModuleCleanup(), SigMatchSignaturesGetSgh(), SMTPParserCleanup(), and StreamTcpPseudoPacketCreateStreamEndPacket(). Definition at line 201 of file flow.h. Referenced by AppLayerIncTxCounter(), DetectBypassRegister(), DetectDceIfaceRegister(), DetectDceOpnumRegister(), DetectDceStubDataRegister(), DetectDistanceRegister(), DetectDNP3Register(), DetectDnsQueryRegister(), DetectFilestoreRegister(), DetectFlowMatch(), DetectFlowRegister(), DetectHttpResponseLineRegister(), DetectLuaRegister(), DetectSslStateRegister(), DetectTlsFingerprintRegister(), DetectTlsIssuerRegister(), DetectTlsSerialRegister(), DetectTlsSubjectRegister(), DetectTlsValidityRegister(), FlowHandlePacketUpdate(), OutputRegisterFiledataLogger(), OutputRegisterFileLogger(), PacketAlertFinalize(), PacketSwap(), SigMatchSignaturesGetSgh(), and StreamTcpPseudoPacketCreateStreamEndPacket(). Definition at line 206 of file flow.h. Referenced by FlowHandlePacketUpdate(), and PacketSwap(). Definition at line 204 of file flow.h. Definition at line 200 of file flow.h. Referenced by AppLayerHandleUdp(), AppLayerIncTxCounter(), DetectBypassRegister(), DetectDceIfaceRegister(), DetectDceOpnumRegister(), DetectDceStubDataRegister(), DetectDNP3Register(), DetectDnsQueryRegister(), DetectEngineInspectENIP(), DetectEngineInspectModbus(), DetectEngineStateResetTxs(), DetectFilestoreRegister(), DetectFlowbitsAnalyze(), DetectFlowMatch(), DetectFlowRegister(), DetectFtpbounceRegister(), DetectHostbitFree(), DetectHttpRequestLineRegister(), DetectHttpResponseLineRegister(), DetectLuaRegister(), DetectPcrePayloadMatch(), DetectProtoContainsProto(), DetectSignatureApplyActions(), DetectSshSoftwareVersionRegister(), DetectSshVersionRegister(), DetectSslStateRegister(), DetectSslVersionRegister(), DetectTemplateRustBufferRegister(), DetectTlsFingerprintRegister(), DetectTlsIssuerRegister(), DetectTlsJa3HashRegister(), DetectTlsJa3StringRegister(), DetectTlsSerialRegister(), DetectTlsSniRegister(), DetectTlsSubjectRegister(), DetectTlsValidityRegister(), DetectTlsVersionRegister(), DetectUricontentRegister(), DetectUrilenValidateContent(), FlowHandlePacketUpdate(), IPOnlyAddSignature(), OutputRegisterFiledataLogger(), OutputRegisterFileLogger(), PacketAlertFinalize(), PacketSwap(), RegisterModbusParsers(), SCSigSignatureOrderingModuleCleanup(), SigMatchSignaturesGetSgh(), SMTPParserCleanup(), StreamTcpPseudoPacketCreateStreamEndPacket(), StreamTcpReassembleDepthReached(), StreamTcpReassembleHandleSegmentHandleData(), and StreamTcpSegmentForEach(). Definition at line 205 of file flow.h. Definition at line 203 of file flow.h. Definition at line 98 of file flow.h. Referenced by AppLayerIncTxCounter(), FlowChangeProto(), and FlowHandlePacketUpdate(). Definition at line 97 of file flow.h. Definition at line 37 of file flow.h. Referenced by __attribute__(), DecodeICMPV6(), DecodeIPV4(), DecodeIPV6(), DecodePPP(), DecodePPPOESession(), DecodeRaw(), DecodeTCP(), DetectFastPatternRegister(), DetectFragBitsRegister(), DetectFragOffsetFree(), DetectIcmpIdFree(), DetectIPProtoRemoveAllSMs(), DetectPortHashFree(), DetectReplaceFreeInternal(), DetectSetupParseRegexes(), FlowStorageRegister(), FlowUpdateState(), ICMPv4GetCounterpart(), PreRunInit(), SCSigSignatureOrderingModuleCleanup(), SigParseApplyDsizeToContent(), TmModuleFlowRecyclerRegister(), Unified2AlertInitCtx(), and UTHParseSignature(). Definition at line 257 of file flow.h. Referenced by AppLayerIncTxCounter(), and AppLayerProtoDetectReset(). Definition at line 255 of file flow.h. Definition at line 256 of file flow.h. Definition at line 168 of file flow.h. Definition at line 161 of file flow.h. Definition at line 192 of file flow.h. Definition at line 185 of file flow.h. Definition at line 253 of file flow.h. Definition at line 251 of file flow.h. Definition at line 252 of file flow.h. Definition at line 68 of file flow.h. Referenced by FlowChangeProto(), and SigMatchSignaturesGetSgh(). Definition at line 66 of file flow.h. Definition at line 89 of file flow.h. Definition at line 85 of file flow.h. Definition at line 87 of file flow.h. Don't return this from the flow hash. It has been replaced. Definition at line 50 of file flow.h. Referenced by FlowDisableFlowManagerThread(), and FlowSetupPacket(). Definition at line 90 of file flow.h. Referenced by FlowDisableFlowManagerThread(), FlowForceReassemblyForFlow(), and TmModuleFlowRecyclerRegister(). Definition at line 48 of file flow.h. Referenced by FlowChangeProto(), and FlowHandlePacketUpdate(). Definition at line 46 of file flow.h. Definition at line 73 of file flow.h. Definition at line 55 of file flow.h. Referenced by FlowChangeProto(), FlowSetIPOnlyFlag(), and SigMatchSignaturesGetSgh(). Definition at line 71 of file flow.h. Definition at line 53 of file flow.h. Definition at line 83 of file flow.h. Definition at line 79 of file flow.h. Definition at line 81 of file flow.h. Definition at line 38 of file flow.h. Definition at line 103 of file flow.h. Definition at line 111 of file flow.h. Referenced by FileDisableMagic(), FileFlowToFlags(), and FlowChangeProto(). Definition at line 110 of file flow.h. Definition at line 118 of file flow.h. Referenced by FileDisableMd5(), and FileFlowToFlags(). Definition at line 117 of file flow.h. Definition at line 122 of file flow.h. Referenced by FileDisableSha1(), and FileFlowToFlags(). Definition at line 121 of file flow.h. Definition at line 126 of file flow.h. Referenced by FileDisableSha256(), and FileFlowToFlags(). Definition at line 125 of file flow.h. Definition at line 130 of file flow.h. Definition at line 129 of file flow.h. Definition at line 115 of file flow.h. 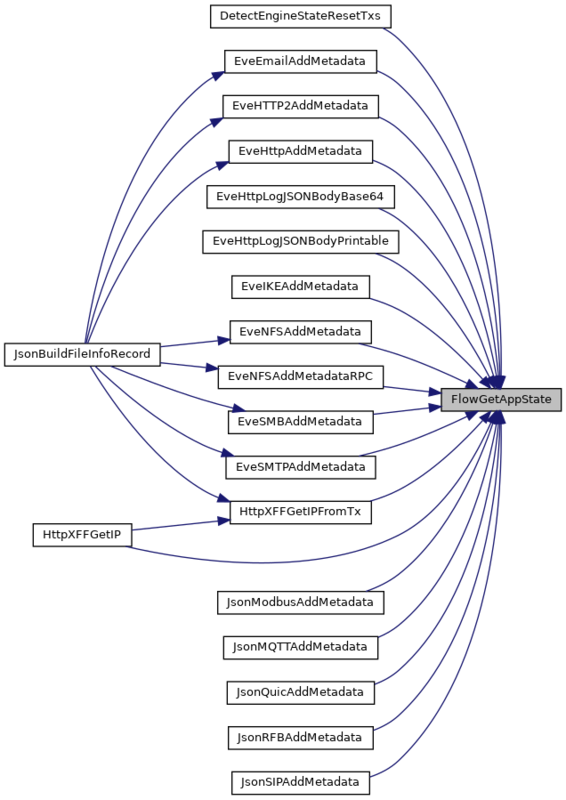 Referenced by FileDisableStoring(), FileFlowToFlags(), and HTPFileOpen(). Definition at line 114 of file flow.h. Referenced by FileDisableStoring(), FileFlowToFlags(), HTPFileOpen(), and SMTPParserCleanup(). Definition at line 237 of file flow.h. Definition at line 236 of file flow.h. Mutex or RWLocks for the flow. Definition at line 219 of file flow.h. Definition at line 238 of file flow.h. Definition at line 240 of file flow.h. Definition at line 241 of file flow.h. Definition at line 242 of file flow.h. Referenced by AppLayerParserRestoreParserTable(), DetectBypassRegister(), DetectDceIfaceRegister(), DetectDceOpnumRegister(), DetectDceStubDataRegister(), DetectDnsQueryRegister(), DetectEngineInspectModbus(), DetectFtpbounceRegister(), DetectLuaRegister(), DetectPcrePayloadMatch(), DetectSshSoftwareVersionRegister(), DetectSshVersionRegister(), DetectSslStateRegister(), DetectSslVersionRegister(), DetectTemplateRustBufferRegister(), DetectTlsFingerprintRegister(), DetectTlsIssuerRegister(), DetectTlsJa3HashRegister(), DetectTlsJa3StringRegister(), DetectTlsSerialRegister(), DetectTlsSniRegister(), DetectTlsSubjectRegister(), DetectTlsVersionRegister(), DetectUricontentRegister(), DetectUrilenValidateContent(), FlowDisableFlowManagerThread(), FlowForceReassemblyForFlow(), FlowGetFlowFromHash(), FlowSetupPacket(), FTPAtExitPrintStats(), HtpConfigRestoreBackup(), HTPFileClose(), RegisterDCERPCParsers(), RegisterDCERPCUDPParsers(), RegisterModbusParsers(), RegisterSSHParsers(), RegisterSSLParsers(), SMTPParserCleanup(), and UTHBuildPacketOfFlows(). Definition at line 239 of file flow.h. Referenced by AppLayerParserRestoreParserTable(), DetectBypassRegister(), DetectDceIfaceRegister(), DetectDceOpnumRegister(), DetectDceStubDataRegister(), DetectDnsQueryRegister(), DetectEngineInspectModbus(), DetectFtpbounceRegister(), DetectLuaRegister(), DetectPcrePayloadMatch(), DetectSshSoftwareVersionRegister(), DetectSshVersionRegister(), DetectSslStateRegister(), DetectSslVersionRegister(), DetectTemplateRustBufferRegister(), DetectTlsFingerprintRegister(), DetectTlsIssuerRegister(), DetectTlsJa3HashRegister(), DetectTlsJa3StringRegister(), DetectTlsSerialRegister(), DetectTlsSniRegister(), DetectTlsSubjectRegister(), DetectTlsVersionRegister(), DetectUricontentRegister(), DetectUrilenValidateContent(), FlowDisableFlowManagerThread(), FlowForceReassemblyForFlow(), FlowGetFlowFromHash(), FlowSetupPacket(), FTPAtExitPrintStats(), HtpConfigRestoreBackup(), HTPFileClose(), RegisterDCERPCParsers(), RegisterDCERPCUDPParsers(), RegisterModbusParsers(), RegisterSSHParsers(), RegisterSSLParsers(), and SMTPParserCleanup(). Definition at line 41 of file flow.h. Referenced by FlowGetPacketDirection(), and StreamTcpPacket(). Definition at line 40 of file flow.h. Definition at line 35 of file flow.h. Definition at line 299 of file flow.h. Definition at line 301 of file flow.h. Definition at line 304 of file flow.h. Definition at line 461 of file flow.h.